Strata mat is a next generation high performance uncoupling mat. This unique product is used under stone and ceramic tile installations. This product was made to replace traditional underlayment materials. Also, the strata mat provides for faster drying of mortar, allowing for shorter time to grout. Mortar Hydration Vents - creates a mechanical bond between the mat and adhesive mortar - allows the mortar to cure faster providing a stronger bond of tile at 16 - 24 hours for faster time to grout. Strata mat is a next generation high performance uncoupling mat. This unique product is used under stone and ceramic tile installations. 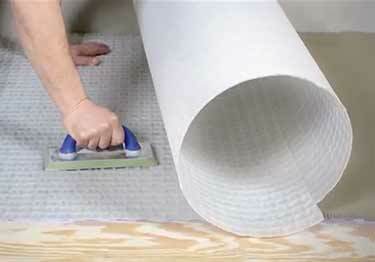 This product was made to replace traditional underlayment materials. Also, the strata mat provides for faster drying of mortar, allowing for shorter time to grout.